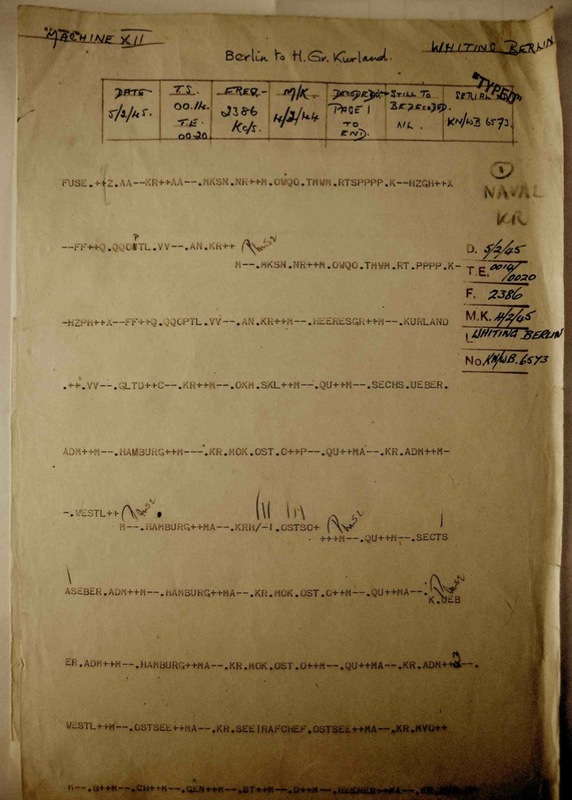 The photographs below show an example of the end product of the ‘Fish’ sections at Bletchley Park - a decrypted German message. 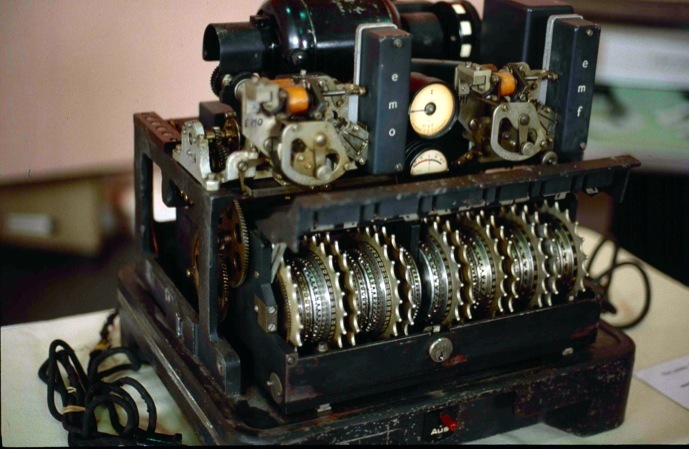 The decrypt has been printed out by a ‘Tunny’ machine, an analogue of the German teleprinter cipher machine (Geheimschreiber, not Enigma). 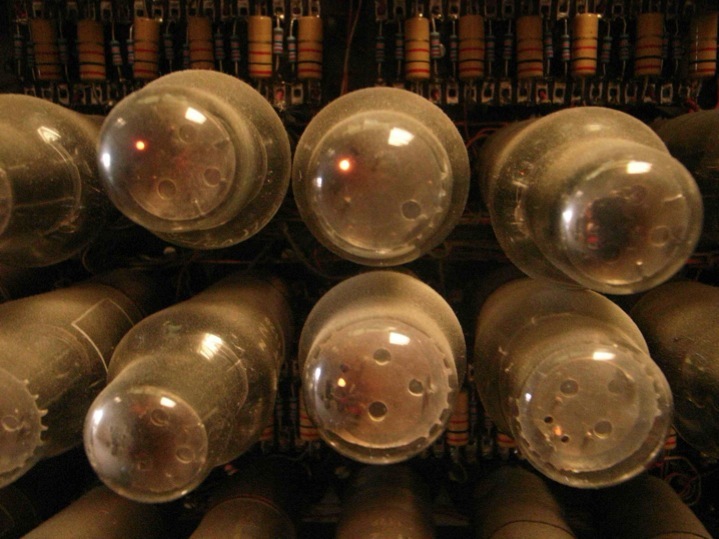 Colossus, other machines and ‘hand’ methods had all contributed to the decryption. 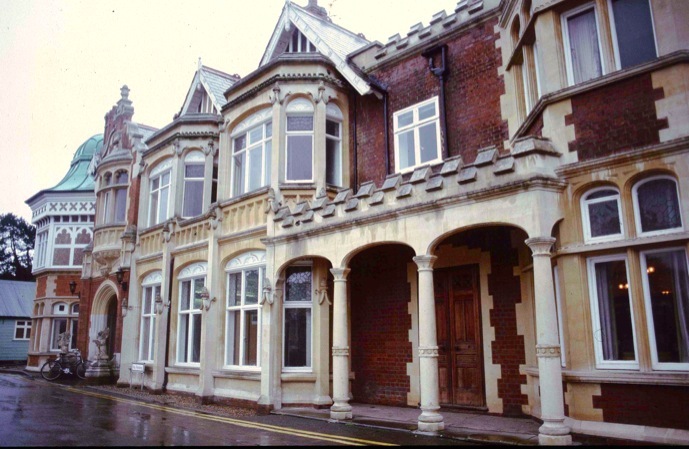 The decrypt would have passed on to an assessment section at Bletchley Park before dissemination to a limited number of military and government users of the intelligence. The message concerns shipping arrangements for evacuating German troops stranded in the Courland in early 1945. The print out shows the message in teleprinter code with machine commands (such as ‘shift to letters’, ‘shift to numerals’ and ‘line feed’). Some plain words can be identified such as Hamburg, Ost and West, and ‘Heeresgr[uppe]’ (Army Group). 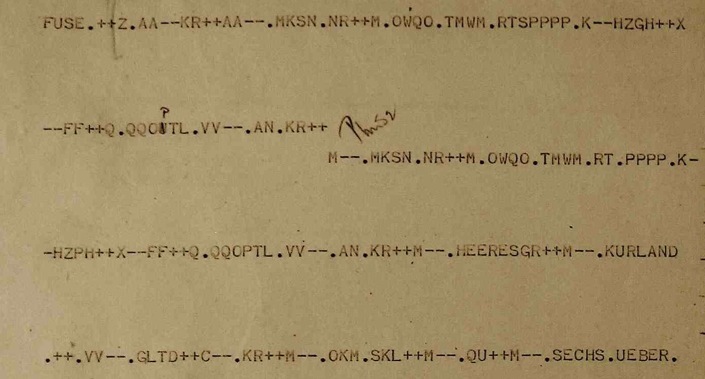 Some other letters represent German military abbreviations, such as HZPH/FF1 (end of first line and start of second and repeated in third line) which is the Kurland (Courland) teleprinter network call sign. However in a lot of cases the letters represent numerals using a ‘shift’ function. ++ means ‘shift to numerals’ and -- means ‘shift to letters’. In numerals mode ‘Q’=1, ‘W’=2, ‘E’=3, etc across the top row of the keyboard. ‘X’ means / in numerals mode (i.e an ‘X’ encountered by the machine when in numerals mode is printed as /; an ‘X’ encountered in letters mode is printed as X). An = to; Kr = Command; Heeresgr[uppe] = Army Group; GLTD = forward to other units named (in full text); MOK Ost & KR OKM.SKL = German naval units; Sechs = six; Ueber = over/above. 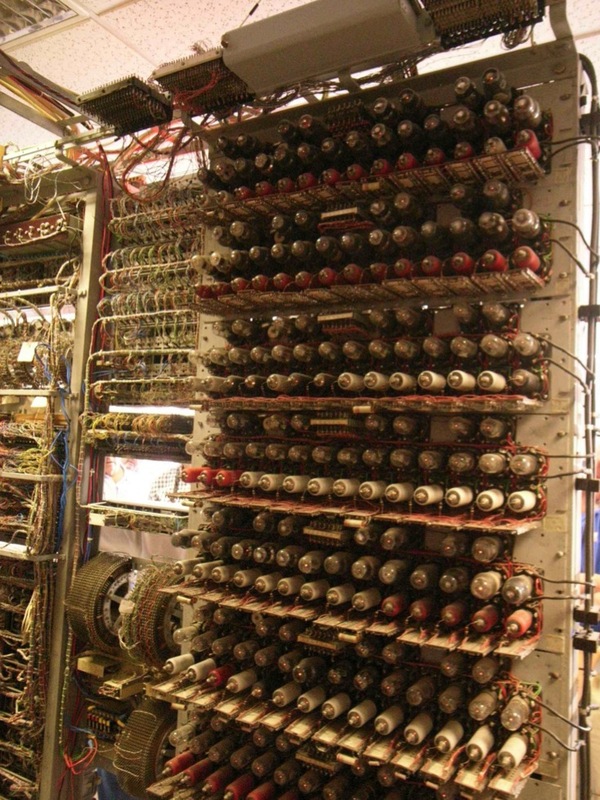 The device would be attached to a teleprinter machine for use and is shown here without its usual metal cover. The twelve wheels can clearly be seen. The cogs that look like bicycle gear wheels are used for setting the wheel starting positions by hand. The raised and lowered pins are positioned on the silver coloured smaller wheels. 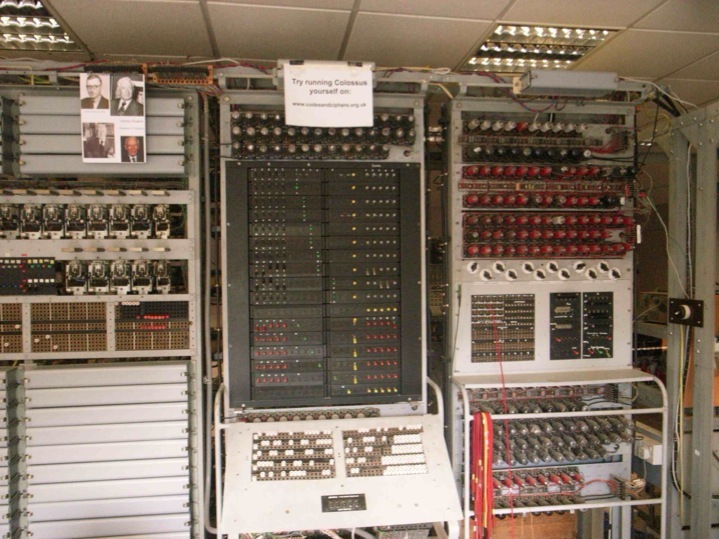 A visit to see the re-constructed Colossus at the National Museum of Computing at Bletchley Park is essential for anyone interested in the subject. 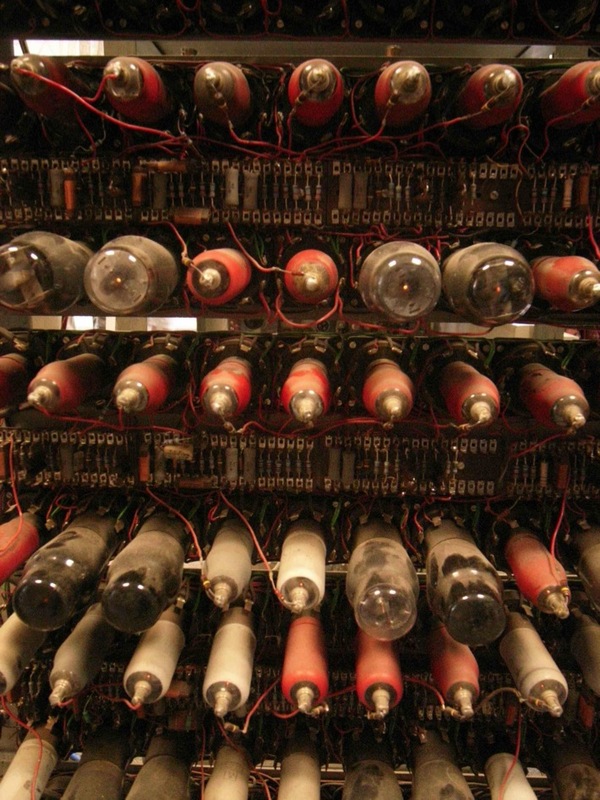 Other exhibits at the museum include a captured Geheimschreiber (Lorenz SZ40/42) cipher machine and a reconstructed Bombe, the machine used for decrypting Enigma messages.